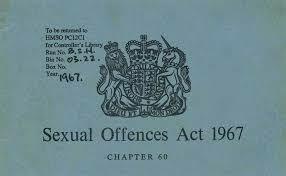 Leo Abse and the Reform of the Sexual Offences Acts : 2017 marks the 50th anniversary of the passing of the Sexual Offences Act, 1967. This change in the law was the first step in legalizing homosexual activities between 21- year- old- men. The talk takes a retrospective look at the law from Victorian times with some of the most controversial and public of the cases that reached the courts before 1967, including the notorious Abergavenny case of 1942, the prosecution of Lord Montagu of Beaulieu in 1954, and the tales of several Members of Parliament whose careers were ended when found importuning and prosecuted. The talk will also explain what events in Society as a whole led to the change in the law, including the recommendations of the Wolfenden Report of 1957. Leo Abse was the charismatic Welsh MP for Pontypool who campaigned with others to bring about a change in the law that nowadays allows parity in the age of consent between the sexes. Over sixteen’s only please. William Cross, FSA Scot, is the author of THE ABERGAVENNY WITCH HUNT, a case from 1942 that saw the prosecution of over 20 homosexuals in a small Welsh town. He looks at the changes made to the law in 1967 by Leo Abse and others. Cross has also written extensively on Evan Morgan, Viscount Tredegar of Tredegar House, Newport, South Wales who is linked to the Abergavenny scandal of 1942 and cover up of some of the key facts in the case.